Plat map of the Town of Madison (Township 7N, Range 9E), from Volume 4, Federal Survey Plat Books. 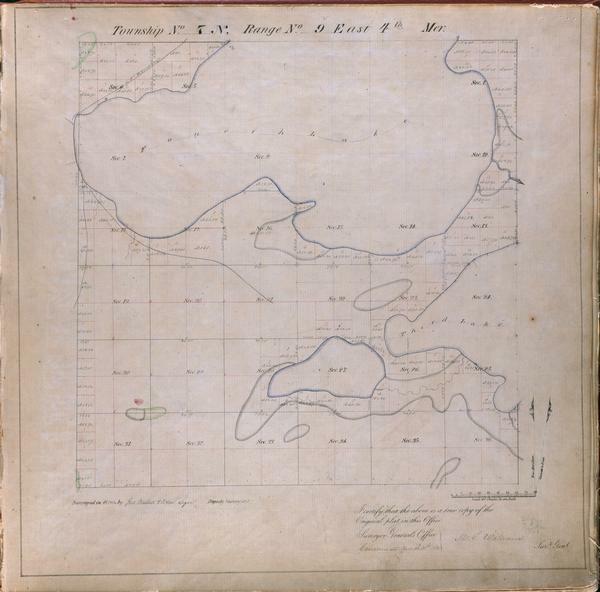 These maps are hand-drawn, certified copies of the original federal survey plat books, made at the Dubuque Land Office 1851-1858, containing plat maps prepared from the field notes of the federal surveys (beginning in 1832). Some or all of the following may be shown: watercourses, rapids, meanders of rivers and lakes, swamp, mineral diggings, roads, paths, fields, forest cover, prairie, windfalls, houses (rarely shown), acreage, meridian variation. Standard information shown: section lines and numbers, type of survey, surveyor's name, date of contract, amount of land surveyed, date of survey, date cost was charged to Surveyor General's account, and certificate of conformity to the field notes, dated and signed by a Surveyor General.